“It’s kind of nice seeing those same old mountains,” said U.S. Army Sgt. 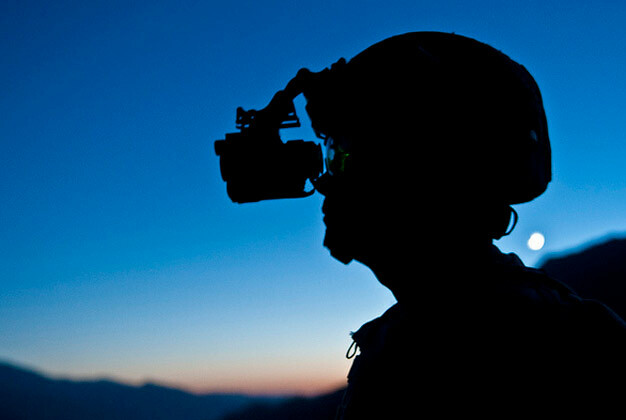 James T. Schmidt, an infantry squad leader from Decatur, Ill., assigned to Company C, 2nd Battalion, 327th Infantry Regiment, Task Force No Slack, while looking through his night vision goggles as the sun sets from a hilltop in the Shal Valley in eastern Afghanistan’s Nuristan Province, Nov. 8. This is Schmidt’s second combat tour to the same region in Afghanistan. Photo by U.S. Army Staff Sgt. Mark Burrell, 210th Mobile Public Affairs Detachment.